Jim Corbett National Park is the oldest National Park in India established in 1936. Jim Corbett National Park is named after Edward James Corbett. He was popularly known as Jim Corbett. He held the rank of a colonel in the British Indian Army. Jim Corbett was a world renowned tiger hunter turned conservationist. He was also an author on wildlife books and a wildlife photographer. 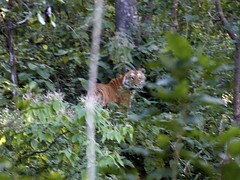 Tiger – Corbett National Park. Jim Corbett Park is home to many wild animals and extinct animals, which includes Indian endangered species like “The endangered Bengal tiger” (India’s National Animal). Tiger safari package is available in this national park. Jeeps are available for the Tiger safari trips. Asian endangered species of animals and birds, which includes endangered species in India is given here. To avoid disturbing the Indian endangered species, tourism related activities are restricted to selected areas in the park. Jim Corbett Wildlife Sanctuary is rich in flora and Fauna. 488 species of different plants are found in the Corbett park. Jim National Park is considered as one of the best bird parks in the world. Around 600 species and subspecies of birds are found in this park alone out of the 2,060 found in Indian sub continent. Similar is the story with raptors. 49/69 species can be found in Jim Corbett National Park. Many wild animals including endangered species of animals and birds and some Himalayan animal species are found in Jim Corbett National Park. Tiger, leopards, wild cats, jungle cats are among those found in this park. Around 50 mammals and 2 reptile species are found in Jim Corbett National Park. During winter months, Jim Corbett National Park turns into a bird watchers paradise. The Corbett National Park is also a paradise for the adventurous and wildlife explorers. 3 How Do I Go to Jim Corbett National Park ? 3.1 What is the Ideal Time to Visit Jim Corbett National Park? 3.1.0.1 Is There Any Good Resorts in Jim Corbett National Park? Gurney House near Nainital Lake, the house where Jim Corbett lived, before settling down at Kenya, is now a museum. It is called Jim Corbett Museum. Jim Corbett Museum is situated at around 80 kilometers from Jim Corbett National park. “Man-eaters of Kumaon” was the best book among the six books he has written. There was a Hollywood movie with the same name in 1948, but the story of the movie was not in line with the contents of the book. Uttarakhand state can be divided broadly into two regions, Kumaon and Garwal. How Do I Go to Jim Corbett National Park ? Ramnagar is the nearest railway station to Corbett National Park at around 10 kilometers away. Ramnagar is the gateway to the Tiger reserve. National Highway 309, which was earlier known as National Highway 121, passes through Ramnagar. Ramnagar bus station is situated close to the railway station. Pantnagar Airport is the nearest airport at around 82 kilometers away. The nearest major International Airport is at New Delhi, at around 270 kilometers away. Chaudhary Charan Singh Airport at Lucknow in Utter Pradesh state is another airport at 430 kilometers away. What is the Ideal Time to Visit Jim Corbett National Park? Mid November to Mid-June is the best season to visit the Jim Corbett park. Except Jhirna Zone, other zones of this park are closed from June to October. Is There Any Good Resorts in Jim Corbett National Park? Corbett view resort in Dhela village, in the southern periphery of the Jim Corbett national park, is surrounded by electrified fencing and is good resort in Jim Corbett Park. They offer rooms at 3000 – 6000 INR plus taxes. Rates are subject to change and please check the current rates, before you book rooms. They also have 3 days / 2 nights package at a higher amount. Resorts like this one offers the ultimate wildlife experience.